Just for fun, we stopped at the old Dante Yard to check out the locomotive turntable that used to operate there. This is it. It’s a large circle and the interior part turns on a track. The track in the area (which is no longer used) is dated 1927. This whole complex must have been a happening place back in the day. 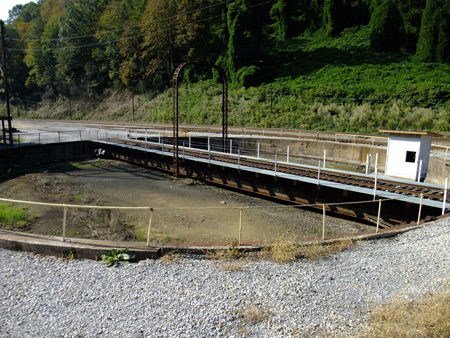 We’re going to do some investigating of other rail operations in this area, including numerous narrow-gauge lines that serviced both the coal mines and the timber industry. Sounds like fun to me. 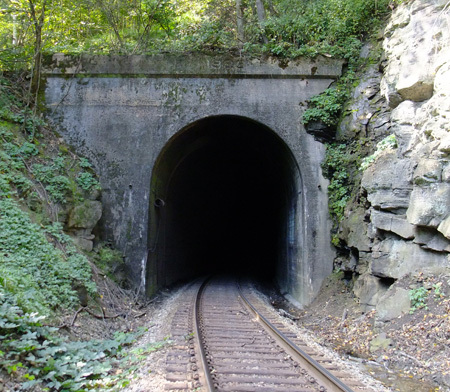 This is Hewitt Tunnel, about 13.6 miles from Elkhorn City. This was the most difficult tunnel for us to reach, since we opted not to wade the McClure River (it would have been easier to do that…the river’s not really deep in that area), but to drive in on a road I’d spotted on Google Earth. The gravel road was about a mile downhill with drainage berms cut across the road a regular intervals. I got my Honda Civic over them with minimal scraping going down, but coming back was a white knuckler as the car spun in the gravel and failed to gain traction. With my buddy’s pushing and the little car’s gutsy (!) front wheel drive, we managed to get the job done, but my hands were shaking from adrenaline when we got back to the main road. I also found out later that all that spinning and stuff had basically destroyed my tires. It was time for new rubber, anyway.